65+ Contoh Soal UAS BAHASA INGGRIS Kelas 11 SMA/MA Semester Genap Terbaru - Halo adik adik yang baik, nah pada kesempatan kali ini kakak ingin membagikan beberapa contoh soal UAS untuk mata pelajaran Bahasa Inggris. Soal ini sudah kakak susun sebanyak 65 soal yang di dalamnya sudah terdapat soal pilihan ganda dan soal essay. dimana kakak telah menyiapkan 50 soal pilihan ganda dan 15 soal essay. 1. Where do you find the caution? A. At the railway station. Read the text and answer questions 2-4. Just to inform you that the meeting will be canceled for tomorrow Mon, May 23 '09 at 10 a. m. as the principal will arrive from Singapore tonight. 2. Isty is very pleased with Sinta because she has ... in her examination. On Wednesday August 13th in class VIII A at eight o'clock. All students of VIII A are supposed to join. Bring one or two friends and wear your funniest clothes to make the party fun. 6. The text is written .... a dinner party. We are going to go camping at Bringin area, from 14 — 16 June 2009. The contribution is Rp75,000.00. Members who would like to join the activity should register their names to Mrs. Katmiati. Registration will be on 10th June, 2009. 7. To whom is the announcement above? 8. When will the camping activity start? What is the meaning of the underlined word? My favourite thing is aquarium. It is a place in which aquatic plants and animals, particularly fish, are kept. The term is applied to single tanks for home use in which fish are kept for their decorative effect and interesting habits and to public institutions with tanks for exhibition and scientific study of aquatic life. I make home aquariums to simulate a natural environment. Aquatic plants supply the oxygen needed by the fish, but often an aerating device is used to furnish additional oxygen. Goldfish enjoy cool water, but the popular tropical fish must have water at a constant temperature of 22°C (72°F) or more. I must keep the water pure and free of algae for long periods by sufficient aeration and by keeping mollusks in the aquarium. A layer of sand or gravel at the bottom of the tank will hold the roots of such important aquatic plants as tape grass, vallisneria spiralis, and aid in the removal of debris. My home aquariums range in size from small fishbowls holding two or three pets to huge tanks. 10. To give additional oxygen, ... is used in a home aquarium. 11. Which is not needed to stimulate a natural environment in a home aquarium? 12. What is the above passage about? Yesterday night was the night of the fair, the following day was holiday. The children at Tim's school were really excited. They ran down the path out of school as fast as they could. Tim ran all the way home, and changed into his jeans and sneakers. He ate his dinner quickly, and sat at the window waiting for his dad to come. He couldn't wait for six o'clock when the fair would begin. He had been saving his pocket money for weeks. When Tim and his family arrived at the fair, it had just opened. Already there were crowds of people swarming around food stalls, displays and dozens of rides. "Can I buy some chips and a drink?" asked Tim. "Okay" sad Tim's dad. "But hang on tightly to your wallet. There are a lot of people around." "I'll be fine', said Tim impatiently. He found a food stall, and ordered his food. When the man brought his chips and drink, without thinking, Tim put his wallet on the counter and picked up his food and drink. When he glanced back, his wallet had vanished! Tim desperately looked around him, but it was no use. All his pocket money was gone. This is a traditional French dish adapted by the Creoles of New Orleans. It is sometimes known as 'Looney soup'. 2. Add sliced onion, a pinch of salt and pepper and the sugar. 3. Cook on a low heat, stirring from time to time, until the onions have browned. 4. Add beef stock and bring to the boil. 5. Sift the flour, stirring hard to avoid lumps. 7. Simmer for 3-4 hours. 9. Top each bowl with bread and cheese and place under grill for two minutes, until cheese has melted. The bowls will be hot, so warn your guests. It is a very filling soup so you won't want much else to eat. It should be served for 4 to 6 people. 16. How much Worcester sauce do you need to make creole onion soup? 17. Why should you warn your guests while having the soup? A. You won't want much else to eat. B. The bowl is placed under grill. C. The cheese has melted. D. The bowls are hot. 18. Simmer for 3-4 hours. " What does 'simmer' mean? Read the following text to answer questions 19 to 22. Once upon a time, there were two butterflies, Teri and Roni. They are friends. Teri and Roni had the same crown. One day, Kodi a frog, saw Teri and Roni quarreling "You took it!" said Roni "No. I did not!" said Teri. "Hey, what's the matter?" asked Kodi. "Teri stole my crown!" said Roni. "No. I didn't," said Teri. "Yesterday, I still had my crown when she came to visit me," said Roni. "Today I cannot find the crown! Look!, she is wearing it!" Roni shouted. "My mom gave me this crown," Teri explained. Kodi suggested they all go to Roni's house. "Where did you put it?" said Kodi to Roni. "I put it on the table," Roni answered. They didn't find the crown. "May be, it fell down." Kodi looked under the table. Nothing was there. "It was my favourite crown!" Roni sobbed. "I didn't steal yours, but if you like it so much, you can have mine," Teri gave Roni the crown. "It's here!" Kodi saw the crown behind the curtain. Roni stopped crying, "Thank God, Kodi found it!" "Sorry, Teri, I accused you. I'm a terrible friend!" "It's OK," said Teri. "Let's say thanks to Kodi!" 19. Where did Kodi find the crown? 22. From the story above we can conclude that Kodi is a ... friend. Read the following text to answer questions 23 to 24. Can make your VCD player in the best operating condition. It can remove the dirts from laser lens thoroughly. Always keep the sound and picture clear when playing. The cleaning disc will show you the perfect motion and sound after cleaning. Protect your VCD player long lasting effectively. If the result is still bad after the normal cleaning, it may be the problem of disc or machine of VCD. Please send to professional maintenance. Insert VCD lens cleaner into your player, press the play button. The disc will then spin to start cleaning process. When cleaning is finished, you will be played with preset program to show you the perfect result of cleaning. Carefully replace the cleaner in the case. 23. What can Y2K VCD lens cleaner do to your VCD player? B.Make the VCD run faster. C.Remove the dirt from laser lens. D.Keep the sound very audible. Read the following text to answer questions 25 to 26. “The Earth's greatest gorge", the Grand Canyon is located in northwestern Arizona. Its vastness is 217 mile long, and its widest spans over 17 miles across. It is not surprising that it has been designated one of the Seven Wonders of the World. The walls of the canyon are made of limestone, sandstone, lava and other rocks. As the day passes the rocks reflect different colours. Many tourists come to the canyon just to watch the rocks change colour. Cottonwood and willow trees grow at the bottom of the canyon. Many varieties of cactus grow here as well. The canyon is also home to many animals, such as bobcats, coyotes, kangaroo rats and deer. Today about 4. million visitors come to Grand Canyon each year. Seeing the Grand Canyon is always a breathtaking and unforgettable experience. 25. What makes the visitors feel interested watching the rocks? A. They have different sizes. B. They reflect human's life. C. They can change into different colour. D. They can change its form. Have you ever visited a place which made you want to stay forever? I have. Last year, I went to Situ Cileunca. At first, I thought the place was only the same as, other places in Bandung. But I was very surprised to find that it was the most beautiful place I've ever visited. There were fantastic meadows, a lake, and a river. The meadow was very large. In the middle of the meadow there were many cows and sheep. All the animals were fat and healthy because they could easily get some grass in that large meadow. At the edge of the meadow, there was a small river. The water in the river was very cold. But, the sound of the streaming water was good to hear, especially in the evening. Not far away from the herd of cattle, there was a lake. The lake wasn't too big, but it was very beautiful. The water was very clear and clean. We could see many fish in the lake. The most amazing thing was the water itself. It was not cold although the weather around was extremely freezing. Unfortunately, I stayed there for just three days because we had to go back to Jakarta. But I have promised myself to come back later. 27. What does the writer tell you about? B. Living in Situ Cileunca. C. Seeing many fish in the lake. 28. What does the paragraph three tell us about? A. The beauty of the lake. B. The weather around the lake. C. The fish in the lake. D. The water in the river. 29. Why was the writer very surprised? A. The place was exceptional. B. The weather around the lake was cold. C. The fish in the lake was beautiful. D. The water was warm. tall animal. In fact, it is the tallest animal in the world. A giraffe has a very long neck. Unfortunately, the giraffe cannot bend its neck easily. Thus, when it wants to drink water at a pool, the giraffe has to spread its front legs apart, so it can reach the water. A giraffe feeds on plant only. Hence, it can reach the leaves on trees easily because of its height. Also, a giraffe has a very long tongue — about 0.5 metres long. The giraffe uses this long tongue skillfully to pick leaves off plants and trees. This tall animal can protect itself very well. It has a very good sense of smell and sight. It can hear very well, too. It can also gallop very fast —at a speed of 50 km.p.h. The giraffe's hind legs and long neck are also very useful. For example, a giraffe can kick its enemy with its hind legs or even hit out with its long neck. 30. What does a giraffe use to kick its enemy? 31. What does the paragraph three tell us about? 32. Why was the writer very surprised? B. Keeping safe from danger. Read the text and answer questions 34 to 36. 136 guestrooms including 1 Penthouse (3 bedrooms), 1 Presidential suite (3 bedrooms), 54 Jayakarta Suites, 39 Executive and 45 Deluxe Rooms. Banquet and function facilities are available for multipurpose, meetings, wedding, seminar and conventions for up to 1000 participants. Recreation facilities wrapped in a unique shape of open air swimming pool, where you can bring your children to play around on a sand beach atmosphere. 34. How many rooms does Hotel Jayakarta have for the guests? 35. Which is INCORRECT about the hotel? A. There are three bedrooms in Penthouse. B. Its function rooms can accommodate more than one thousand people. C. The guests can bring their children on the sandy beach near it. D. It provides its guest with an open air swimming pool. The underlined word means we can ... easily. I am very glad to write this letter to you. How is your school? Here in Sleman, we are preparing for the Independence Day celebrations. So everybody is very busy. First, we are going to have some sports competition. There will be soccer, volleyball and a tug of war competition. The winning team will receive a big goat as a prize. I'm going to play in the football and volleyball competitions. Then, we are going to have a wayang show on the night before the Independence Day. The dalang is a famous one from Yogyakarta. He will perform all night long. Have you ever seen a wayang show? It is very entertaining. Finally, I'm going to attend a flag raising ceremony at school on Independence Day. After that, we will give out prizes to the competition winners. What are your plans for the Independence Day celebrations? Please write back and tell me. 37. What is the prize for the winners of the sports competition? 38. How many competitions will Joko join? 2. Put your card into the slot. 3. Punch in your PIN. 4. When the choices appear, select "withdrawal from checking". 5. Enter the amount that you want to withdraw. 6. When your money appears, remove it. 7. When the machine asks if you are finished, press "yes". 8. Take out the receipt. 41. What should you do after inserting your card? 42. What is the text about? A. The best way to keep our money safe. B. The procedures of saving money in a bank. C. The description of an Automatic Teller Machine. D. The ways to withdraw money from Automatic Teller Machine. 43. What do you have to do if you want to withdraw again? A. Punch in your PIN again and take the money. B. Press "NO" when the machine asks if you're finished. C. Enter the amount that you want to draw. D.Remove the money when it appears. Theatre is a place where people entertain the audience well. The people who ... (44), called actors and actresses, act in plays on a stage. A ... (45) can be raised platform, or it can be part of the floor in a room, either in the centre of the room or against the wall. The audience is very important part of a theatre because it is for the audience that actors and actresses act ... (46), and the playwright writes interestingly. Without an audience, they are only rehearsing or practicing. 1. The five-footed bear liked to help other animals. 2. One afternoon, when the five-footed bear went home, he found a rabbit under a mahogany tree. 3. But all animals who lived with him didn't feet strange. 4. Once upon a time there was a strange bear who lived in a jungle. 5. Then, the five-footed bear brought him to his home. 6. His home was open for anyone who wanted to stay. 7. He had five feet. 8. The rabbit looked hungry. 50. Arrange the following sentences into a good recount text. 1. The bus was air-conditioned, so I felt comfortable. 2. All the passengers got off, did their prayers and had dinner. 3. Then I took a taxi to my grandparents' house. 4. In my holiday I visited my grandparents in Bandung. 5. The bus stopped at Pekalongan. 6. I went there by bus. It left at five in the afternoon. 7. The bus reached Bandung at six. 2# Match the English word into Indonesian! 3# Read the following dialogue and then answer the questions! 11. How long have Amir and Budi waited? Answer: 3 quarter of an hour. 12. What for did Amir and Budi wait? 13. When did the new restaurant open? 14. Who told Budi that the restaurant had a delicious menu? 15. Mention one expression of giving a suggestion! Answer: Why don’t we eat there? 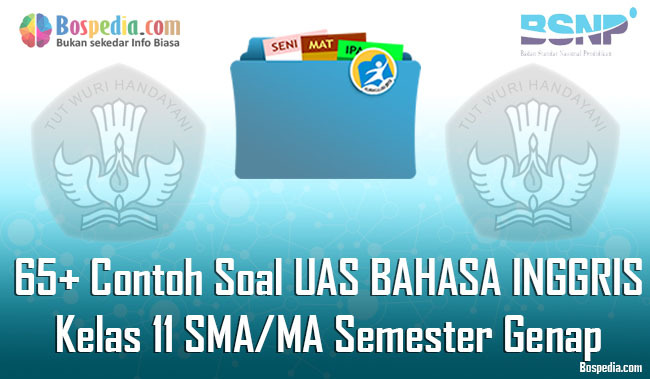 Demikianlah informasi yang bisa kami sampaikan, mudah-mudahan dengan adanya 65+ Contoh Soal UAS BAHASA INGGRIS Kelas 11 SMA/MA Semester Genap Terbaru ini para siswa akan lebih semangat lagi dalam belajar demi meraih prestasi yang lebih baik. Selamat belajar! !